In our method, a regular -gon is filled with a figure of symmetry type (which has all the symmetries of the -gon). In practice, these figures belong to a small number of families which we describe below. For , let the unit circle be parameterized via . 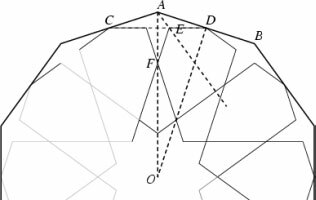 We construct the -pointed star polygon by drawing, for , the line segment connecting and . Note that and that is the regular -gon. For some values of , will intersect , dividing into a number of subsegments. We often choose to draw only the first subsegments at either end of , which we indicate with the extended notation . Figure 1 shows the different stars that are possible when . Our implementation generalizes this construction, allowing to take on any real value in . When is not an integer, point is computed as the intersection of line segments and , and is replaced by the two line segments and . An example of this generalization is given in Figure 2. Figure 1: The six possible eight-pointed stars when is an integer. 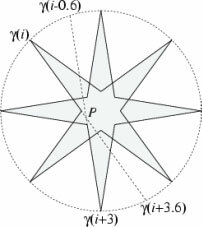 Figure 2: An star for non-integral . Figure 3: An arrangement of sixfold stars can be reinterpreted as rosettes. The pattern is one of the oldest in the Islamic tradition. Figure 4: The construction of a ten-pointed rosette. When sixfold stars are arranged as on the left side of Figure 3, a higher-level structure emerges: every star is surrounded by a ring of regular hexagons. The pattern can be regarded as being composed of these surrounded stars, or rosettes. Placing copies of the rosette in the plane will leave behind gaps, which in this case happen to be more sixfold stars. The rosette, a central star surrounded by hexagons, appears frequently in Islamic art. They do not only appear in the sixfold variety, meaning that we must generalize the construction of the rosette to handle arbitrary . The construction given by Lee  yields an -fold rosette for any while preserving most of the symmetry of the hexagons. Each hexagon has four edges not adjacent to the central star; all four edges are congruent. Moreover, the outermost edges lie on the regular -gon joining the rosette's tips, and the two ``radial'' edges are parallel. A diagram of Lee's construction process is shown in Figure 4. To begin, inscribe a regular -gon in the unit circle and draw the -gon whose vertices bisect its edges. Let and be adjacent vertices of the outer -gon and and be adjacent vertices of the inner -gon with bisecting . The key is to then identify point , computed as the intersection of with the bisector of . Then is the intersection of with the line through parallel to . The rest of the rosette follows through application of symmetry group : edges and lead to the outer edges of the hexagons, while copies of become the points of the inner star, which can be completed with the construction given earlier. 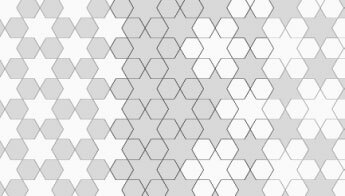 By sliding along the bisector of , we can continuously vary the shape of the rosette while preserving the congruence of the four outer hexagonal edges. Some Islamic designs feature a motif slightly more complicated than a basic rosette, where opposing limiting edges from adjacent tips of the rosette are joined up. The resulting object has the same symmetries and number of outer points as the rosette, but with an additional layer of geometry on its outside. We refer to these as ``extended rosettes''. A ninefold extended rosette appears on the right.